"HCO Bulletin" redirects here. For for the Scientology publication, see Hubbard Communications Office Bulletins. HCO houses a collection of approximately 500,000 astronomical plates taken between the mid-1880s and 1989 (with a gap from 1953–68). This 100-year coverage is a unique resource for studying temporal variations in the universe. The Digital Access to a Sky Century @ Harvard project is digitally scanning and archiving these photographic plates. In 1839, the Harvard Corporation voted to appoint William Cranch Bond, a prominent Boston clockmaker, as "Astronomical Observer to the University" (at no salary). This marked the founding of the Harvard College Observatory. 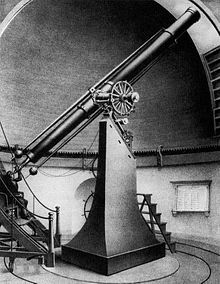 HCO's first telescope, the 15-inch Great Refractor, was installed in 1847. That telescope was the largest in the United States from installation until 1867. Between 1847 and 1852 Bond and pioneer photographer John Adams Whipple used the Great Refractor telescope to produce images of the moon that are remarkable in their clarity of detail and aesthetic power. This was the largest telescope in North America at that time, and their images of the moon took the prize for technical excellence in photography at the 1851 Great Exhibition at The Crystal Palace in London. On the night of July 16–17, 1850, Whipple and Bond made the first daguerreotype of a star (Vega). Harvard College Observatory is historically important to astronomy, as many women including Annie Jump Cannon, Henrietta Swan Leavitt, Cecilia Payne-Gaposchkin, and Williamina Fleming performed pivotal stellar classification research. Cannon and Leavitt were hired initially as "computers" to perform calculations and examine stellar photographs, but later made insightful connections in their research. From 1898 to 1926, a series of Bulletins were issued containing many of the major discoveries of the period. These were then replaced by Announcement Cards which continued to be issued until 1952. In 1908, the observatory published the Harvard Revised Photometry Catalogue, which gave rise to the HR star catalogue, now maintained by the Yale University Observatory as the Bright Star Catalogue. The Minor Planet Center credits many asteroid discoveries to "Harvard Observatory." ^ "HCO Astronomical Plate Stacks". Retrieved 2008-11-25. ^ "Digital Access to a Sky Century at Harvard (DASCH)". Retrieved 2014-07-14. ^ "The Great Refractor". Retrieved 2008-11-25. ^ Drout, Maria (12 November 2012). "A Big Step Backward for Time Domain Astronomy". Astrobites. Retrieved 16 December 2014. ^ "Reaching for the Stars". Archived from the original on 2008-05-17. Retrieved 2008-11-25. Dava Sobel (2016). The Glass Universe: How the Ladies of the Harvard Observatory Took the Measure of the Stars. Viking. ISBN 978-0670016952. Wikimedia Commons has media related to Harvard College Observatory. Wikisource has the text of the 1921 Collier's Encyclopedia article Harvard Observatory.